The incident of “raining sea creatures” might be one of the incredible news lately. You would perhaps think an octopus and other sea creatures raining from the sky as a phenomenon which is too good to be true, but yes it’s true. This happened in China. Proofs have emerged showing the images of such sea creatures raining from the sky after being tossed out of the ocean by a violent surge of water brought about by the storm. These images were captured in the coastal city of Qingdao in eastern China’s Shandong Province on Wednesday. Although the pictures seemed unbelievable, incidents like this can possibly occur especially if there is the presence of super strong winds ripping the ocean water very violently. Fish can be sucked up by tornado-strength winds which create a watersprout. With the hit of the wind to the water, its no wonder animals under the surfacewater can be hauled and displaced miles away from its source. The Chines Meteoroligical Administraion confirmed there had been numerous sea creatures blown onto the land by a watersprout. 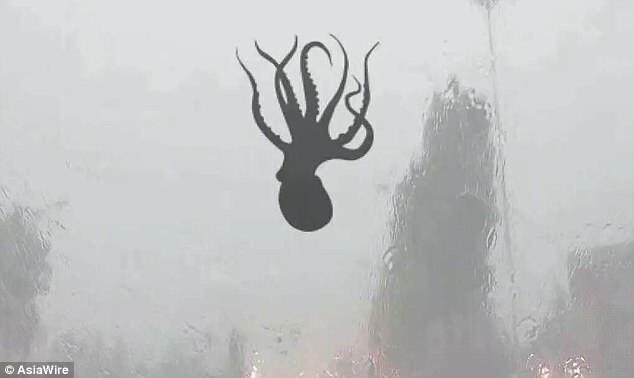 Like this picture in Qingdao, China showing an octopus sticking to a windscreen. 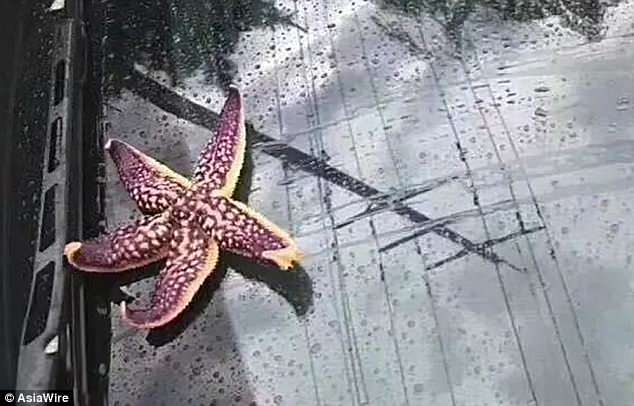 A starfish landed to a car’s windshield. A shrimp and a mollusk were able to escape from the sprout. What have caused this creatures to be blown away from their home is the strange weather incident called watersprouts- tornadoes over water which toss fish into the air and release them to the ground.